Leezy Lindsey: My Mom is so cool! Something I looked forward to just about everyday when I was little was the "after school snack." Remember those? After I got off the school bus, I would make plans with my friends to meet up a little later and then it would be time to see what treat my Mom had prepared for my hungry little belly. My Mom made all sorts of delicious treats. Some of the real good ones were, graham crackers and milk, grilled cheese sandwiches, and cottage cheese and pineapple. 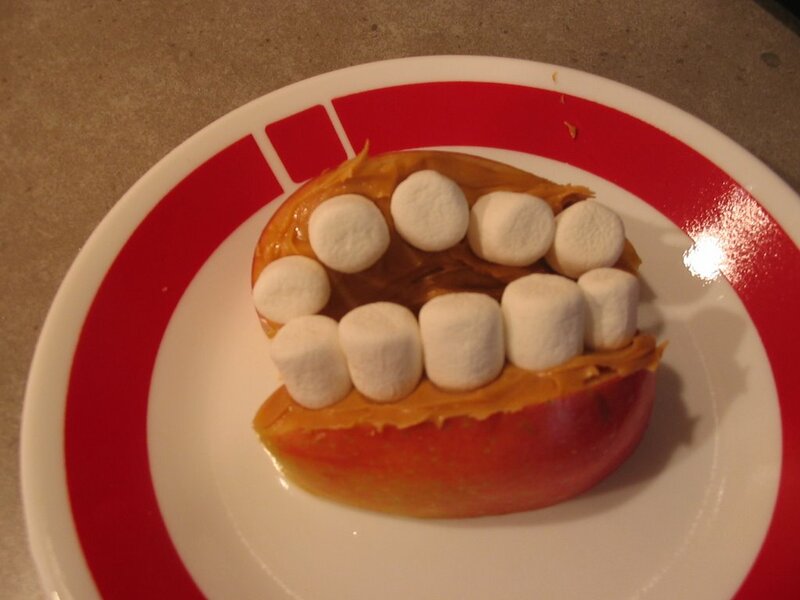 My very favorite though was apple teeth. I made them the other day. Sinking my teeth into this peanut buttery goodness brought back so many memories! What foods take you down memory road when you eat them? I must confess Linds. Great minds think a like! I had this same type of post saved. I talked about smells, tastes and songs that brought you back somewhere!! You beat me to the punch girl! I'll post mine a little later. Caramel Apples: Fall time at Apple Hill in Northern California. LOVE IT!! Hmmm. There's this weird pasta salad my mom used to make that has bits of celery in it. I really don't like it, but I always eat it anyway hoping that it'll be good. Because my earliest memory of that salad was also one of my favorites. It was when our family spent a day at this lake in Oklahoma called Yost Lake. It was so much fun. I loved that day. There it is. That is fantastic. I was wondering what it looked like. Kind of nasty---all Tim Burtony.